This report follows on from the previous report on the Senate’s activities and outlines the Senate‘s activities from the commencement of the 5th term of office on 15th December 2004, i.e. the commencement of the 1st sitting of the Senate in its 5th term of office after the regular elections to the Senate in November 2004, to the close of 2005. Changes were made to the composition of the Senate in 2005 in relation to regular elections to the Senate. Jiří Šneberger (ODS – Civic Democratic Party) was elected in the first round, Electoral District No. 7, Electoral District of Plzeň jih (Pilsen South). following Senators retained their Senate mandate: Pavel Eybert (ODS), Přemysl Sobotka (ODS), Jiří Liška (ODS), Václav Jehlička (no party affiliation) a Tomáš Julínek (ODS). The following Senators became new members of the Senate: Vlastimil Balín (KSČM – Communist Party of Bohemia and Moravia), Milan Bureš (ODS), Jan Hálek (ODS), Jan Horník (no party affiliation), Liana Janáčková (no party affiliation), Zdeněk Janalík (ODS), Tomáš Jirsa (ODS), Bedřich Moldan (ODS), Ludmila Müllerová (KDU-ČSL – Christian Democratic Union - Czechoslovak People’s Party), Jiří Nedoma (ODS), Jiří Oberfalzer (ODS), Igor Petrov (SNK), Vlastimil Sehnal (ODS), Karel Schwanzenberg (ODA), Rostislav Slavotínek (KDU-ČSL – Christian Democratic Union - Czechoslovak People’s Party), Jiří Stříteský (ODS), Pavel Sušický (ODS), Jaromír Štětina (no party affiliation), Alena Venhodová (ODS), Jiří Žák (ODS) and Jan Nádvorník (ODS), who became a Senator based on a ruling made by the Constitutional Court stating that he had been legitimately elected. He took his pledge at the 3rd sitting of the Senate on 27th January 2005. 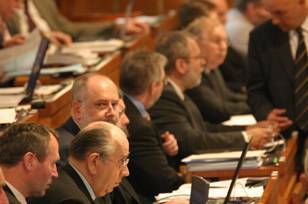 Senator Přemysl Sobotka was elected President of the Senate and Petr Pithart, Jiří Liška, Edvard Outrata and Petr Smutný were elected Vice-Presidents of the Senate. The Senate established the same Senate bodies during the 5th term of office as in the previous term of office (more about Senate bodies here). One new aspect was the establishment of the Standing Senate Commission on Media. Here you will find a complete summary of the Senate’s legislative activities as of the commencement of the 5th term of office. There were 8 sittings of the Senate during the period in question, spaced over 26 days. In total, Senators discussed 39 international treaties and gave their approval to the ratification of 35 of these. They adjourned the discussion of one (Senate Document No. 424 – 4th term of office – a Government motion submitted to the Parliament of the Czech Republic with regard to expressing its renunciation of the Convention for the Suppression of the Traffic in Persons and of the Exploitation of the Prostitution of Others and its final report dated 21st March 1950) and did not adopt a resolution regarding one international treaty (Senate Document No. 42 – a Government motion submitted to the Parliament of the Czech Republic with regard to expressing its consent to the ratification of the Framework Convention on Tobacco Control, as signed in Geneva on 16th June 2003). The Government took back the remaining 2 international treaties and presented 10 new ones in their place. The Senate also discussed 116 bills, including 1 constitutional bill, which the Senate rejected (constitutional bill on referenda – Senate Document No. 113). Of the remaining 115 bills passed to the Senate it approved 29 bills. During the discussion of 13 bills the Senate expressed its wish not to handle them. In 6 cases the Senate did not pass any resolution and the bills were therefore passed after the statutory period had expired. 53 bills were returned to the Chamber of Deputies with proposed amendments. In 24 cases the Chamber of Deputies agreed with the Senate’s wording, whilst a further 29 bills were passed in the Chamber of Deputies’ original wording. The Senate rejected 14 bills in the period in question. In 10 cases the Chamber of Deputies insisted on its original wording and in 4 cases the bill did not receive the necessary majority of votes and was not passed. The bill on the conflict of interests was an unusual case. Given the amendment to the Act on Elections to Municipal and Regional Assemblies, the Senate considered this to be an act according to Article 40 of the Constitution and therefore requiring of the approval of both chambers of Parliament. The Senate rejected this bill after the passing of a thirty-day time limit. However, the Chamber of Deputies did not wait for the ruling of the Senate and sent the bill to the President of the Republic to be signed. The President did not sign the bill. Nonetheless, the Chamber of Deputies voted down his veto and the bill was published in the Collection of Laws and came into force on 1st March 2005. A group of Senators swiftly filed a motion with the Constitutional Court for the repeal of this Act on the grounds of breach of constitutional procedure in the course of its adoption. Another motion for its repeal was filed at the same time on the grounds that it was unconstitutional. At its session on 22nd June, the Constitutional Court abolished this bill, stating that the law regulating elections to municipal or regional assemblies must be considered to be an electoral law within the bounds of Article 40 of the Constitution, thus confirming the opinion of the Senate. Therefore, the Senate discussed 116 bills in total as of the commencement of the 5th term of office. It approved 29 of these and expressed its wish not to handle 13 bills. 53 bills were returned to the Chamber of Deputies with proposed amendments, 15 bills were rejected, and in 6 cases the Senate did not pass a resolution. Of the 53 bills which the Senate returned to the Chamber of Deputies with proposed amendments, 24 were approved in the Senate’s wording, i.e. 45 %, whilst the Chamber of Deputies insisted on its original wording in 29 cases, i.e. 55 %. Senators attend a sitting of the Chamber of Deputies and justify the ruling of the Senate in the case that a bill has been returned with proposed amendments or if a bill has been rejected. This has been the case since the 2nd term of office. This practice has yet to be regulated in the rules of procedure, but continues to develop nonetheless. At its third sitting (on 28th January 2005), the Senate ratified Resolution No. 65 and set forth the manner of delegating the representatives of the Senate of the Parliament of the Czech Republic with regard to returned and rejected bills for discussion at the Chamber of Deputies in such a way that it shall entrust a Senator and his/her substitute with the task of justifying to the Chamber of Deputies a Resolution of the Senate which returns a bill to the Chamber of Deputies with proposed amendments or rejects the bill. In the process, the entrusted Senator is the correspondent of the “Guarantee Committee”, whilst his/her substitute is the correspondent of another committee to which the bill was directed or a correspondent and member of the “Guarantee Committee” in the case that the bill was only directed to one Senate committee. If the Senator does not agree to his/her assignment, the chair shall open a debate in which it will be possible to file motions. The Senate returned certain bills to the Chamber of Deputies in 2005. Here are some examples. Of the acts which the Senate returned to the Chamber of Deputies with proposed amendments we should mention the Electronic Communication Act (Senate Document No. 4). The fundamental aim of the new legislation was the determination of a legal framework to support the development of electronic communication services and the network of electronic communication. The legislation was designed to ensure as simple a market-entry (authorisation activity) as possible, to formulate the position and powers of the regulatory authority to a high level (in particular the aims of regulation and decision-making, including price regulation), to take into consideration the interests and rights of the users of electronic communication networks and services, and to gradually replace sector-specific regulation with the application of general regulations based on regulations of commerce and competition. The Senate made a number of comments regarding the bill and principally endeavoured to remove from the act the so-called “favouring” of Czech Television (Česká televize) over the other organisations on the market. However, the Chamber of Deputies did not take these comments into account and passed the act in its original wording. Another interesting act which was returned with proposed amendments is the bill for the Employment Act (Senate Document No. 33). The bill presented is a response to relatively broad discussion on the appropriate nature of the regulation of Section 13, which deals with the ban on the so-called “Švarc system”. This provision imposes the obligation of a legal entity or natural person to ensure the performance of routine tasks to ensue from the subject of its activity by its employees as employed for this purpose in labour-law relations pursuant to the Labour Code. In its proposed amendments, the Senate moves to completely omit Section 13 from the Employment Act. The Senate also paid detailed attention to the amendment of the Roads Act (Senate Document No. 116). The principal intent of the bill is to increase the safety of road traffic and in doing so reverse the alarming levels of accidents in the Czech Republic. The aim of the sponsor of the bill was to create such a legal environment in which to increase driver motivation to adhere to the rules of road traffic and at the same time ensure the swift enforceability of the law in cases when the rules set out are infringed. This involves such moves as the introduction of a points system, the overall toughening of sanctions for breach of obligation (including the possibility of withholding driving licences), and other measures. At the same time, the bill transposes the latest EU guidelines on restraint systems for children in road traffic and guidelines regarding new driving licences. In the course of discussions, the Senate adopted a number of proposed amendments which make the entire amendment of the act more precise and which remedy shortcomings that had made their way into the bill during the discussion stage at the Chamber of Deputies. The bill was then returned to the Chamber of Deputies with proposed amendments. However, the Chamber of Deputies did not agree to these proposals. An amendment to the Conflict of Interests Act (Senate Document No. 465 from the 4th term of office) was transferred to the Senate at the close of 2004. According to its sponsors, the purpose of the motion was to broaden the effect of the Conflict of Interests Act to include members of the assemblies of selected self-governing regional units. Electoral law stipulates the broadening of incompatibility of position for representatives (e.g. with the statutory body of an allowance organisation). It also introduces the possibility of imposing a financial penalty for false declarations (property, etc.) and for non-compliance with the obligation to declare. Sanction regulations concerning the so-called misuse of information obtained from declassified notification have also changed; the declaration of liability for damages here changes to liability for administrative delict. It was the opinion of the Senate that this was a bill which belonged among the acts approved by the Parliament of the Czech Republic according to Article 40 of the Constitution of the Czech Republic, which means that the approval of both chambers is required for its ratification, and consequently a time limit for its discussion does not ensue for the Senate. The Chamber of Deputies did not agree with this and did not wait for the ruling of the Senate, sending the bill to be signed by the President of the Republic in spite of the Senate´s negative stance. The President decided to return the amendment to the Conflict of Interests Act to the Chamber of Deputies and allow it to vote on the bill once again. By doing so the President intended to prevent disputes as to whether or not the bill was legitimately adopted. Nonetheless, the Chamber of Deputies voted down his veto and the bill was published in the Collection of Laws and came into effect on 1st March 2005. Two motions for the repeal of this act were filed with the Constitutional Court. Both were filed by groups of Senators, the first criticising the procedure of approval and the second the unconstitutional nature of its provisions. At its session on 22nd June, the Constitutional Court abolished this bill, stating that the law regulating elections to municipal or regional assemblies must be considered to be an electoral law within the bounds of Article 40 of the Constitution, thus confirming the opinion of the Senate. The aim of the Chamber of Deputies’ bill on the construction of certain motorways, high-speed roads, roads, and transit rail corridors (Senate Document No. 55) is to determine special procedure for the construction of certain motorways, high-speed roads, roads, and transit rail corridors in the form of simplified and abbreviated building and other administrative proceedings. The bill considers the construction of these structures to be building work undertaken in the public interest in the case that they are defined as publicly beneficial structures in the approved planning documentation. At the same time, it was proposed that the process of purchasing the land concerned should also be simplified (including expropriation and the settlement of ownership rights, joint ownership rights, or the other rights of third parties to the property concerned). In addition to its meritorious regulation, the bill also contains accompanying amendments to the Act on the Protection of Nature and the Countryside and the Act on Entries of Ownership and Other Property Rights. It was the Senators’ opinion that the act encroaches on ownership rights in an inappropriate manner and does not even improve the current situation. The Senate believes that the issue this act attempts to deal with ought to be primarily handled by a new Building Act and a new Act on Administrative Procedure. 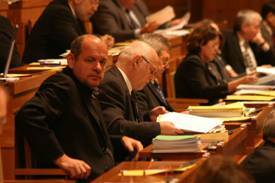 The Chamber of Deputies did not approve the bill in a repeat vote. According to its sponsors, the endeavour behind the proposed amendment to the Penal Code (Senate Document No. 83) is to strengthen legal instruments in the fight against particularly serious, organised criminal activity. It involves a method which (from the perspective of public interest) allows a move away from the merited punishment of an accused individual in exchange for the uncovering and punishment (destruction) of the entire bracket of organised crime. The measures are intended to motivate accused persons to “break away” from the criminal structure and cooperate with the bodies that are active in criminal proceedings in exchange for immunity from charges or the advantage of a lesser sentence. The current regulation of cooperation was found to be insufficient (the bond to criminal gangs means that the threshold of applying the methods outlined is very high, whilst the low certainty of receiving an advantage does not motivate). The Senators clearly did not agree with this amendment to the act and referred to the fact that our Penal Code already contains motivational elements to ensure that an accused person cooperates with the bodies active in criminal proceedings as it is. The Senate subsequently rejected this amendment. Not even in a repeat vote at the Chamber of Deputies did the bill receive a sufficient number of votes and so the bill was not adopted. The Senate also dealt with an amendment to the Act on Churches and Religious Societies (Senate Document No. 111). The bill presented is a response to the fact that the Constitutional Court repealed four provisions (or their parts) of the law in question, in particular Section 6, Subsection 2, which contains the legislative abbreviation “religious legal entity”. At the same time, a new definition of this expression was not included in the justification of the award of the Constitutional Court. This expression remained in other provisions and its content became unclear. The Senate rejected the bill since it reached the conclusion that it was unconstitutional. In particular its key provision in Section 15a, Subsection 1, Second Sentence, according to which “legal entities pursuant to letters a) and b) become legal entities pursuant to this Act through the records pursuant to this Act”, is, according to the prevailing opinion of the Senate, an effort to circumvent the ruling of the Constitutional Court dated 27th November 2002 and to join constitutive effects with the records of the group of subjects in question. The Chamber of Deputies insisting on its original wording in a repeat vote. The Senate did not adopt a resolution on a number of bills. Here are a few examples. It is not a common end to the legislative process for the Senate not to adopt a resolution. By coincidence, however, there were three such cases at a single session, the 8th sitting of the Senate. The first of these was a bill on the construction of the 06R – 24L runway at Ruzyně Airport in Prague (Senate Document No. 160), the aim of which was to declare the construction of the runway in question as being in the public interest and to determine special procedure in the form of simplified and abbreviated building and other proceedings, including the purchase or expropriation of the land and structures concerned. A number of Senators reproached this bill, among their reasons being its possible unconstitutional nature with regard to the award of the Constitutional Court in a similar case (in the abolishment of the bill on the construction of dams on the River Elbe (Labe)). The second was an amendment to the Environmental Agriculture Act (Senate Document No. 174), the main aim of which was the need to bring Czech legal regulation in this area in line with EC law. The Senators that appeared in the debate mainly criticised the inclusion and form of an unrelated amendment to the Administrative Fees Act. The final law on which the Senate did not adopt a resolution at this meeting was an amendment to the Act on the Protection of Rights Regarding Species of Plants (Senate Document No. 175), which laid down the principal aim of harmonising the national system of the protection of rights regarding species with the EU system so that two different approaches to the legal protection of species of plants do not exist for a single legal institute. In spite of the fact that the Senate did not adopt a definitive resolution on the three bills mentioned above, it would be incorrect to assume that the Senate did not devote the proper attention to their discussion. These acts were duly discussed in the committees and plenary session of the Senate and only in final voting was there insufficient agreement of opinion, meaning that none of the possibilities set forth by the Constitution of the Czech Republic could be successfully approved. Once the 30-day limit which the Constitution allows the Senate to discuss bills has passed, such bills are handled as if the Senate had approved them or had expressed its wish not to handle such bills. The Senate has been dealing with the so-called “European agenda” (in line with an amendment to its rules of procedure) since the accession of the Czech Republic to the European Union. This means that the Senate discusses legislative bills, communication documents, draft decisions by EU bodies, and the stance of the Government of the Czech Republic to such documents. The Senate entrusted two of its committees in this respect, the Committee on European Affairs and the Committee on Foreign Affairs, Defence, and Security, which each regularly deal with documents in their own sphere of activity. The Senate acts through the plenary session. The Senate discusses all stances or recommendations relating to the mandate of the Government of the Czech Republic as adopted by the committees for discussion at EU institutions. This it does at its sittings on the motion of these committees. It is also possible to include a European point of discussion on the programme at a sitting of the Senate with a motion put forward by a minimum of 17 Senators. The Government of the Czech Republic takes into account the stance put forward in the statement of the Senate when preparing positions for subsequent meetings on the proposal in question at EU institutions. The Senate discussed a total of 12 documents at its sittings in 2005 (7 legislative bills (prefixed with “N”) and 5 communication documents (prefixed with “K”). You will find more information on discussions of the European agenda in 2005 by clicking here. The Senate continued the discussion of Senate initiatives submitted during the previous term of office at the beginning of the fifth term of office. You will find more detailed information by using the link to the relevant number of Senate or Chamber of Deputies Document. 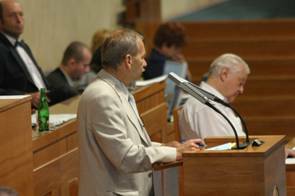 In December 2004 a Senate bill was submitted to the Chamber of Deputies which amends Act No. 193/1999 Coll. on the State Citizenship of Certain Former Czechoslovak State Citizens, as amended by Act No. 320/2002 Coll. (Senate Document No. 406). The aim of the amendment to the Act submitted is to revoke the provisions of Section 5, which placed time restrictions on the possibility of former Czechoslovak state citizens re-acquiring state citizenship, this on the grounds of the poor functioning of the original texting of the Act. The Act passed through the Chamber of Deputies and as (Senate Document No. 206) the Senate expressed its wish not to handle the proposal at the 9th sitting of the Senate. The Act was published in the Collection of Laws under number 46/2006. At its 4th sitting the Senate approved a Senate bill submitted by Senator Jitka Seitlová and other Senators which amends Act No. 247/1995 Coll. 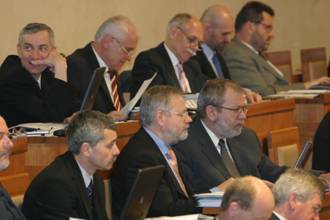 on Elections to the Parliament of the Czech Republic and the Amendment and Supplementation of Certain Other Acts, which was submitted to the Senate on 1st November 2004 (Senate Document No. 436). The basis of the proposed amendment to the Elections Act is the introduction of postal voting as an alternative to voting in person in polling stations. The Chamber of Deputies did not approve this bill (Document No. 945). In January 2005 a group of Senators (Tomáš Julínek, Jiří Liška, Jaroslav Mitlener, and others) submitted a motion for a Senate constitutional bill on a referendum of consent of the Czech Republic to the Treaty on the Constitution of Europe, as signed in Rome on 29th October 2004, including the reports appended to this and its appendices, and on the amendment of Act No. 1/1993 Coll., the Constitution of the Czech Republic, as amended by subsequent constitutional acts (Senate Document No. 13). The sponsors justified the need for a referendum to be held in the matters in question given the importance of this international treaty, the content of which significantly affects the sovereignty of the Czech Republic. The motion was directed to 2 committees at the 3rd sitting of the Senate and at the same time the Senate requested a statement from the Standing Senate Commission on the Constitution of the Czech Republic and Parliamentary Procedure. The Senate discussed this motion at its 4th sitting and approved it. The bill was submitted to the Chamber of Deputies (Document No. 937), where it awaits discussion at the Constitution and Legal Committee. In March 2005 the Committee on National Economy, Agriculture and Transport submitted a Senate bill which amends Act No. 219/2000 Coll. on the Property of the Czech Republic and its Presentation in Legal Relations, as subsequently amended (Senate Document No. 46). The aim of the proposed amendment is to speed up the transfer to the relevant municipality of state property acquired as a consequence of death. The motion was directed to 3 committees at the 4th sitting. The Senate discussed this motion at its 6th sitting on 23rd June 2005 and approved it. The Senate bill was transferred to the Chamber of Deputies (Document No. 1030) and is currently at the 1st reading stage. Also in March 2005 the Committee on National Economy, Agriculture and Transport submitted a Senate bill which amends Act No. 328/1991 Coll. on Bankruptcy and Settlement, as subsequently amended, and other acts (Senate Document No. 47). The sponsors of the amendment set the target as making bankruptcy proceedings more effective and supplementing unclear procedural rules and worked through the as yet unregulated area of the bankruptcy of banks, savings banks, and credit cooperative societies. The motion was directed to 3 committees at the 4th sitting. The Senate discussed the document at its 5th sitting and approved the motion. The Senate bill was transferred to the Chamber of Deputies (Document No. 977) and its discussion will commence with the 1st reading stage. It was also in March that Senator Martin Mejstřík and other Senators submitted a Senate bill which amends Act No. 245/2000 Coll. on Public Holidays, Other Holidays, Important Days, and Days of Rest from Work (Senate Document No. 49). The aim of the bill is to include Good Friday among so-called “other holidays” and to cancel March 8th, International Women’s Day. The motion was directed to 2 committees at the 5th sitting. The Senate then discussed the motion at its 7th sitting on 15th September and approved the motion. This bill too awaits discussion at the first reading stage at the Chamber of Deputies (Document No. 1168). The Senate constitutional bill of Senators Jaroslav Kubera, Tomáš Julínek, Jiří Šneberger, Jiří Liška, Miroslav Škaloud, and others, which amends Constitutional Act No. 1/1993 Coll., the Constitution of the Czech Republic, as amended by later constitutional acts (Senate Document No. 65), was presented to the Senate on 26th April 2005. The motion was directed to the Constitution and Legal Committee at the 5th sitting of the Senate and the Senate requested a statement from the Standing Senate Commission on the Constitution of the Czech Republic and Parliamentary Procedure. The Senate discussed this document at its 7th sitting on 15th September 2005 and approved the motion. It was transferred to the Chamber of Deputies for discussion to get underway soon after (Document No. 1130). The Senate bill of Senators Karel Tejnora, Jiří Liška, Jiří Oberfalzer, Ivan Adamec, František Příhoda, and others, which amends Act No. 361/2003 Coll. on the Service Relation of Members of Security Forces, as subsequently amended, and Act No. 221/1999 Coll. on Professional Soldiers, as subsequently amended (Senate Document No. 66), was also presented to the Senate on 26th April 2005. However, this bill was later taken back by its submitters. The Senate bill of Senator Martin Mejstřík and other Senators, which amends Act No. 140/1961 Coll., the Penal Code, as subsequently amended (Senate Document No. 91), was submitted to the Senate on 10th June 2005. The motion was directed to 3 committees at the 6th sitting. The Senate discussed this document at its 7th sitting on 6th October 2005 and approved the motion. The Chamber of Deputies should now deal with the bill (Document No. 1169). The Senate constitutional bill of Senator Jan Hadrava and others, which amends Constitutional Act No. 1/1993 Coll., the Constitution of the Czech Republic, as amended by later constitutional acts (Senate Document No. 93), and a motion relating to this (Senate Document No. 94) were also presented to the Senate in June. The Senate included these in its 6th sitting, where representative of the submitters Senator Jan Hadrava took the motions back on the grounds of lack of time in relation to the approaching close of the term of office of the Chamber of Deputies. The Senate bill of the Committee on Mandate and Parliamentary Privilege, which amends Act No. 238/1992 Coll. on Certain Measures Related to the Protection of Public Interest and the Incompatibility of Certain Positions (the Conflict of Interests Act), as subsequently amended (Senate Document No. 130), was submitted to the Senate on 29th July 2005.The Senate directed this bill to committees at its 7th sitting and later rejected it at its 8th sitting on 25th January 2006. Senator Jan Horník submitted a Senate bill to amend Act No. 150/2002 Coll., the Rules of Judicial Procedure (Senate Document No. 141), to the Senate in September. The Senate included this in its 8th sitting, where the submitter took it back on the grounds of lack of time in relation to the approaching close of the term of office of the Chamber of Deputies. The Senate bill of Senator Jiří Pospíšil and other Senators on the devolution of certain items from the property of the Czech Republic to the ownership of the municipalities (Senate Document No. 149) was presented to the Senate on 25th October 2005. This is a bill which is intended to complete the process of returning historic property which was nationalised in the past to the municipalities. The Senate directed this document to 3 committees at its 8th sitting and extended the period for discussion in committees by 30 days. The Senate bill of Senators Jiří Liška, Josef Pavlata, Alena Palečková, Václav Jehlička, Martin Mejstřík, and other Senators on the Nation’s Memory Institute and on the Amendment of Certain Other Acts (Senate Document No. 185), was presented to the Senate on 29th November 2005. The submitters propose setting up a specific state institute, the Nation’s Memory Institute, whose task it would be to contribute at a higher level to Czech society coming to terms with the period of communist, totalitarian power between 1948 and 1990, in particular with the phenomenon of repression and the surmised activity of the security units of the totalitarian state (State National Security, Military Secret Service, the Border Patrol, the Remedial Training Board, the General Staff Intelligence Service, Ministry of the Interior forces, etc.). All documentation relating to the issue in question is to be gathered at a single centre. The sources created in this way are to become the basis of historical examination and will educate the public, whilst also being part of the public administration of making documents accessible, “screening” (lustration), etc. The Senate directed this document to 3 committees at its 8th sitting and extended the period for discussion in committees by 30 days. According to Article 84 of the Czech Constitution, Constitutional Court judges are appointed by the President of the Republic with the approval of the Senate. The Senate dealt with 2 requests from the President of the Republic to express its consent to the appointment of Constitutional Court judges in 2005. The Senate received the appointment of JUDr. 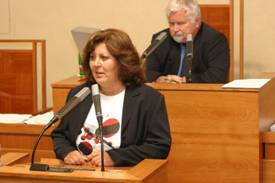 Vlasta Formánková as a Constitutional Court judge in June 2005 and expressed its consent to this appointment in August 2005 (Senate Document No. 95). 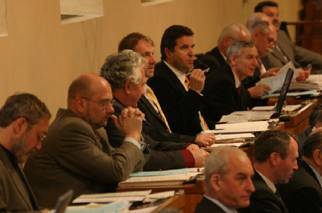 At its 8th sitting in December 2005 the Senate discussed an application for the appointment of JUDr. Vladimír Kůrka as contained in Senate Document No. 166. His appointment was approved by the Senate. This completed the number of Constitutional Court judges projected by the Constitution of the Czech Republic, i.e. 15.